Bradley T. Gross serves as Assistant Director (AD) for the Administration Division and as the Bureau's Chief Financial Officer. In his position, he directs all critical financial and program functions in the following areas: budget development and execution, finance, procurement and property, the Inmate Trust Fund program, facilities management, capacity planning, and construction, including environmental review. Mr. Gross joined the Department of Justice in 1992 as a Financial Management Systems Analyst in the Finance Staff, Justice Management Division (JMD). In 1995, he became the Assistant Director for the Finance Staff, JMD. Mr. 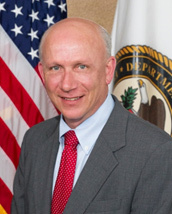 Gross began his career with the Bureau in 1999 as the Chief of the Finance Branch and in 2010, he was selected as the Senior Deputy Assistant Director for the Administration Division. Mr. Gross assumed his current position on November 1, 2015. Mr. Gross received his Bachelor of Science from Fordham University and studied for his M.B.A. at Long Island University. Mr. Gross also attended Harvard University's John F. Kennedy School of Government and completed the National Institute of Corrections' Executive Excellence training program. Mr. Gross received the 2001 Assistant Director's Award for Excellence in Administration, the 2011 Justice Management Division Cooperation Award, and the 2012 Director's Special Recognition Award. Mr. Gross joined the ranks of the Senior Executive Service in 2010.